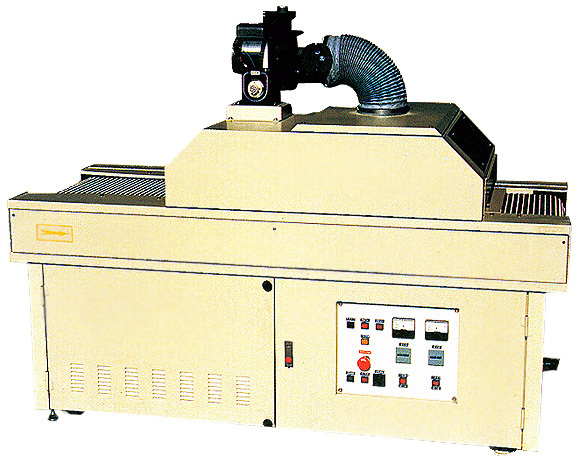 UV Dryer(UVC-322) - Guger Industries Co., Ltd. Suitable for stencil printing, offset printing, sticker brand, metal, glass, paper, Acrylic board, PC board, PC, PVC, ABS, Ps, etc. By using high UV output metal halide lamp, workpiece could be instant dried. This unit employs automatically switch off power, protect the over load motor and over high temperature, enemy stops and control fuse. The dry distance is adjustable, just depends on customers' require. With special design cooling cold filter, the system can keep heat sensitive materials, materials, such as PVC film, PP film and PET film from temp effect in their curing process.